This post was first published on Write at Your Own Risk, the VCFA faculty blog: Pushing the Limits. Reposted here just so I can get this blog going again. This trip, of course, has been the reason for my long, long blogging hiatus. Time now to get back on the trail. Coe’s post about keeping the momentum and Amanda’s Hey You post both made me think about the mind-games we have to play with ourselves to keep going. Which of course reminded me of my own large project under way right now. It’s trying, poor thing, to get past its saggy-baggy-middle and I often find myself getting royally in its way. Some of you know that from mid-October to early November, I was part of a group that aimed to trek the Annapurna Circuit. We didn’t do the whole thing because the week we started was the week that Nepal and the world (or at least anyone who was paying attention) got gob-smacked by this terrible catastrophe that killed over forty trekkers and left maybe 50 missing. We were three days away from that pass and the worst we suffered included bad colds, sleep-deprivation, and mild altitude spaciness. We ended up hiking in some glorious places, meeting some generous, gracious people, and falling in love with Nepal. To Chame, uphill and downhill until I feel I have no breath left at all but still I keep going and somehow at the end of the day I am still breathing and my muscles have stopped emitting screaming pain signals from all this overtime work. 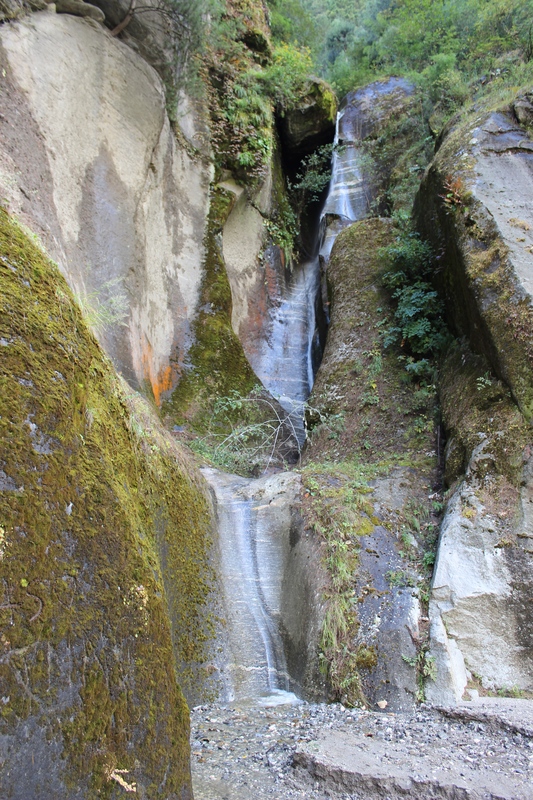 Past dozens of waterfalls that are sculpting the rocks. Each striation gleams, ivory on granite, elephantine in scale. You can hear the water roaring down, sometimes half an hour before you round a corner and see it. It is as if the source of all life on the planet is here; here is the heartbeat, and our puny wants and whims fall away at the sight. And story is like that. You should be able to feel it long before you know what it is. You have to trust that every corner you turn is taking you in the right direction. Sometimes, too, you have to recognize that there’s an avalanche ahead and you may have to turn back. That’s not failure. It’s letting go your original, logical plan, and going with what the universe has handed you. That could be an 800 foot waterfall, or it could be laughing children. Be grateful, and keep on trekking. This entry was posted in Uncategorized and tagged Annapurna circuit, hiking, Nepal, writing process. Bookmark the permalink.